Snipperclips: Cut It Out, Together! was one of the best launch titles the Nintendo Switch had going for it, and I enjoyed it very much. It combined colorful characters with intuitive paper puzzles, where players worked together to snip each others' characters into the perfect shapes to solve each stage. 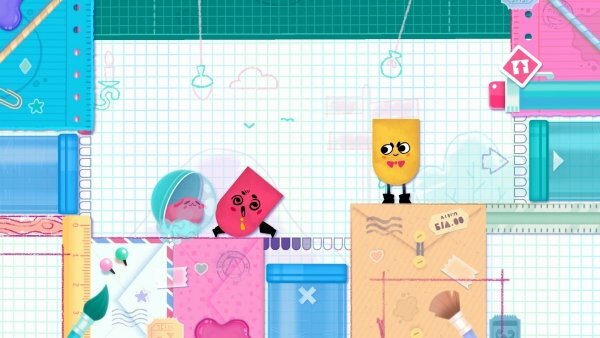 The game is getting a new lease on life as Snipperclips Plus: Cut It Out, Together, releasing this November 10 for Switch with additional comic and toy box worlds as well as Blitz Mode multiplayer games and Stamp mode so you and your friends and other players can create your own artistic imagery. These are interesting twists on what was previously available for players to indulge in, so this seems like a hefty bit of additional content to play around with. If you already have the original game, you'll be able to add the new content to your game via DLC, but you'll have to pay a little extra for it. Unfortunately it's not free, but the extra bits of game time that should be added are probably worth shelling out a few extra bucks for. If you're looking for a little more of the Switch's best puzzler, it's definitely worth picking up the whole package, unless you already bought the original game. Then pick up the DLC for some good fun with your loved ones.